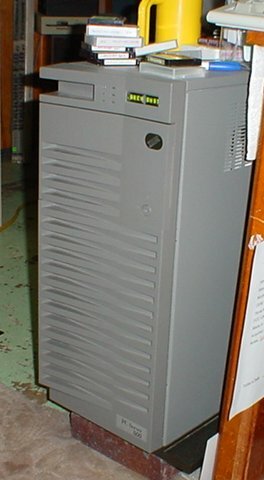 PC Server 500 "Greyghost" was actively serving pages on the world wide web. It isn't doing so any more, but the web site still exists so...Have a look! Hopefully someday it will do so again. I have two of these awesome systems. There is no other word you can use to describe them--the size, the weight, the performance--all these factors make this one awesome system. This the highest end pure x86 based Microchannel system one can have. Though I am the proud owner of two of these fine systems, I do not have enough space to keep them both out and operating at the same time. The unit that I do have up and operating is named Greyghost for its color and remarkably quiet operation considering how many fans it has and what kind of system it is. 12X RAID hot swap drives in two logical drives/arrays. 1. There is not enough SCSI "address space" on the IBM "Spock" adapter to handle the DDS-2 tape streamer, internal CD-ROM drive AND the external Pioneer changer. While the Pioneer changer's drives appear as logical units under one physical unit ID, I don't think the NT driver handles this correctly and in any case either the internal CD or DDS-2 streamer gets pushed out of the picture. I think NT's drivers are to blame for this as the setup does show correctly in systems programs. 2. Of the two IBM FWSR adapters installed, one is being used at full capacity managing two arrays on each of its two SCSI channels. The other adapter is installed but presently unused for future expansion purposes into the third RAID channel that the system supports. The DDS streamer and internal CD-ROM are not attached via the pass-through cable to the FWSR adapter because this causes problems with Windows NT setup and I wanted to avoid these problems easily.